Personally, I like the Black Trumpet mushrooms better than the very popular one - the yellow Chanterelles. In fact, they belong to the same Chanterelle family . Before I got into the wild mushrooms hunting, I often heard of people talked about that the yellow Chanterelles are the best choice of the wild edible mushrooms. When I went to the wild mushroom hunting, I was particularly looking for the yellow chanterelles, and often neglected the black trumpets. 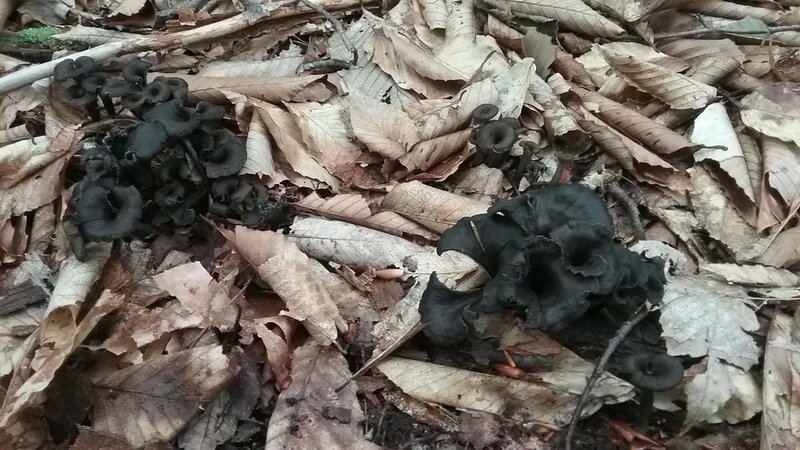 Until one day, I saw a big patch of the black trumpets in an oak grove floor. I reluctantly picked some of them and took home. I tried and that was very good! 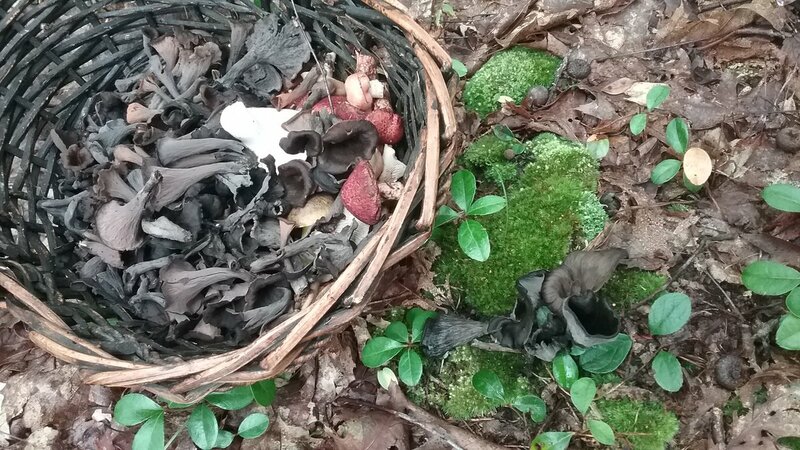 Since then, I stsrted to gather more of the black chanterelle mushrooms. In my experience, the yellow chanterelles are good only when they are young and fresh. When they are old, they become rubbery. You can't dry them, they become rubbery. You can't freeze them either, they become rubbery also. One way to get a better use of it is to fry them with seasonings and butter, then, you can freeze them to store. But, when comes black trumpets, you can dry them, you can freeze them, you can do whatever with them, their flavor are just as good as the fresh pick ones. They are versatile in cooking. 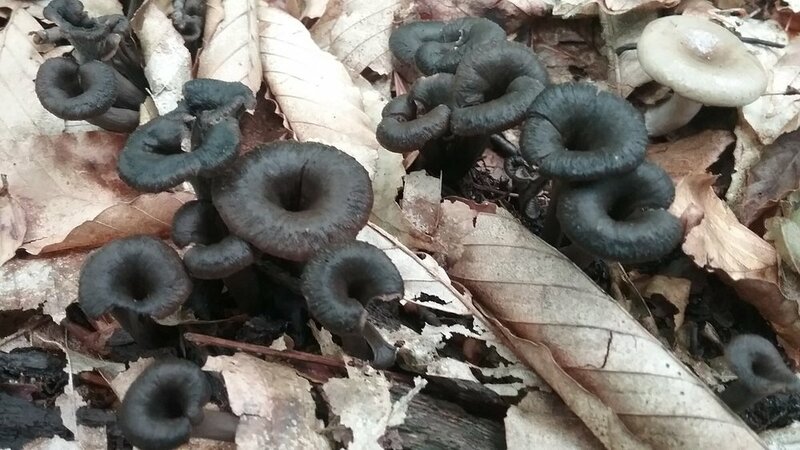 Above picture, the right corner one, is an albinal black trumpet, or something else mushroom? 2016 was a great year for chanterelles here. I even found large patches of red cinnabars. I dehydrated a lot of black trumpets and put them in the food processor to make a coarse powder. I made some of the golden chanterelles into fine powder. After dehydrating and processing, I used a mortar and pestle to grind them. Glad I still have a lot of powder. There were no chanterelles at my place this year. Hi, Camiller. That's a good idea to make powder of the black Chanties. I learned from you ! Last year, I found a gameland tons of yellow chanties. Some were so big huge weighed more than 1 LB! A classic dish made from dried/powdered Black Trumpets is a cream cheese spread/dip. It's very easy to make. Melt butter, briefly saute chopped white bulbs of green onion, salt, add Black Trumpet powder. The powder will soak up the butter, so I like to add a small amount of dry white wine (not rice wine) to help re-hydrate the powder. Then add 8 ounces cream cheese and mix/blend together over low heat until smooth. For the spread a thick mixture is good. For the dip it should be looser/thinner. To adjust thickness add small amounts of milk while still on low heat. Pour completed mixture into a bowl and top with chopped green onion (green part). Chill and then serve. I often take this to pot-luck parties along with either wheat crackers or crusty bread. Sounds good! I'll try your recipe, thanks Dave. Do you know hickory run state park ? where I found abundant black trumpets along the dirt roadside. I picked basketful. They are easy to clean, bugs free! I can't wait to pick them again, so much fun! I think I know the exact spot in HR SP where you found the trumpets. It's along a paved road leading toward the beach/lake. I've found them there before, but I didn't remember to check that spot this year. One more thing about the trumpets. Once they are dried and stored, they may become a little flexible. If you want to powder them, then it's good to place the dried ones on a cookie sheet inside a warm oven (200 degrees) for maybe 10 minutes or so. This causes them to become brittle and they are easier to turn to powder. Yes! On the way to the lake we found them.we like to picnic there. Last summer was a Chanterelle-summer. Hopefully next summer will be the same. Thanks for your black trumpet powder making technics. I'm sure I'll try it next year. Mmmm. I just made some of that black trumpet cheese spread. Unfortunately I started out with too much trumpet powder and had to keep diluting it with cream cheese. Once I got the right mixture ratio it turned out great. I used Dave's recipe above but I had to guess on the amount of mushroom powder.